Compelling specs, uber-premium design and numerous enhancements make the Oppo R7 one of the most desirable mid-range smartphones on the market. Oppo isn't a household name in the west, but that probably won't be the case for much longer. Ever since the firm's inception just over a decade ago, the Chinese manufacturer has been renowned for producing high-quality, affordable consumer electronics. Originally specialising in MP3 and DVD players, Oppo recently moved into the smartphone sector, and has enjoyed booming success in mainland China. Groundbreaking devices such as the Find 5, N1 and R5 have propelled Oppo into the global spotlight, and like many other Chinese smartphone manufacturers the brand is also beginning to gain traction in international markets. Rather than being something totally unorthodox, the newly released Oppo R7 is more of a refined sequel to the paper-thin R5 – and isn't to be confused with the phablet variant of the R7, the R7 Plus, which was also launched during Oppo's 10th birthday celebrations in May. Unlike many other Chinese smartphones, the SIM-free R7 attracts no international price markup. Although most official stores and other partner retailers are located in Asia, you can pick up a SIM-free R7 online. Oppo sells directly via both Amazon and Oppostyle, and the R7 is currently available for just £250 (around $400, AU$515). While ultimately not as powerful as beefier rivals such as the OnePlus One and Honor 6, and despite the fact that it's missing the fingerprint scanner from the R7 Plus, the Oppo R7 still packs some impressive specs. Oppo has included a Qualcomm Snapdragon 615 Octa-core processor, an Adreno 405 GPU and a hefty 3GB of RAM – 1GB more than the R5. The front-facing shooter has received a resolution bump to 8MP, and the rear 13MP unit now derives from Samsung, rather than Sony. 'VOOC Flash Charge' technology is once again on board, enabling the R7's relatively small 2320mAh battery to charged to 75% in just half an hour. Unfortunately there's still no NFC, but Oppo has included dual-SIM 4G LTE connectivity. Akin to the Samsung Galaxy A3, the Oppo R7's all-metal design is what sets it apart from other mid-range offerings. In terms of look and feel the R7 really does surpass all expectations for an affordable smartphone, and almost everything seems more refined than on the R5. The capacitive navigation keys aren't backlit, but they do free up space on the R7's screen. At first glance the front of the Oppo R7 looks extremely similar to the R5, partly thanks to the retention of Oppo's physical navigation keys below the display. Up top things look a little less lopsided, with the improved 8MP front-facing snapper moving to the left of the central earpiece while the proximity and ambient light sensors remain on the right. Hidden beneath the front glass is an LED notification light that's only visible when illuminated. Unfortunately, as on the Moto G (2014) it's of the white variety, so you won't be able to differentiate between notification types without firing up the display. The bottom edge looks almost identical to that of its predecessor, with two antenna bands flanking the centrally positioned microUSB port and single microphone. Outdoor screen viewability is great, even in the brightest of conditions. Gazing at the Oppo R7's Full HD screen is a real pleasure, it's one of the best examples on an affordable handset. A high pixel density of 445ppi makes for crisp-looking text and images, and the inclusion of AMOLED display technology is very welcome. Vivid colours and wide viewing angles combine with an extensive brightness range to create a stellar viewing experience, regardless of lighting conditions. This impressive screen also features Oppo's '2.5D Arc Edge' design, whereby the glass gently tapers off at the edges, resulting in a pleasant-looking droplet effect. Unfortunately the R7's metal frame interrupts the flowing glass at the very edge, preventing you from fully appreciate the innovative design. With a thickness of 6.3mm the R7 is chubbier than the R5, but it's lighter, weighing just 147g. Unusually, the metallic power button is located on the left-hand side. While that may sound problematic, the key is easily accessible with your middle finger if you're right-handed and lefties will find the key perfectly positioned for their thumb. You can double-tap the screen to wake the phone, or the home button to sleep it if you prefer, although you will miss out on the great tactile feedback. Like the power key, the volume rocker on the right edge feels very premium. That said, being right-handed I often found myself hitting the volume keys with my thumb by accident when gripping the R7. Oppo has implemented a nifty 4G dual-SIM and microSD setup in order to keep the sides of the R7 clean. The tray located above the volume rocker can hold one microSIM and nanoSIM, although if you wish to expand the 16GB of internal storage by up to a further 128GB you'll have to swap out the nanoSIM for a microSD card. Sacrificing storage for a second SIM isn't ideal, but it's a sacrifice that was necessary in order to retain the R7's slender profile and minimal look. Last year's R5 was compromised in multiple ways, and the omission of a 3.5mm headphone jack was arguably the most notable example. Thankfully you won't need to use a pesky microUSB-to-headphone adapter with the R7, as Oppo has managed to cram a 3.5mm jack into the slightly thicker frame. Another antenna band is present up top, alongside the headphone socket. 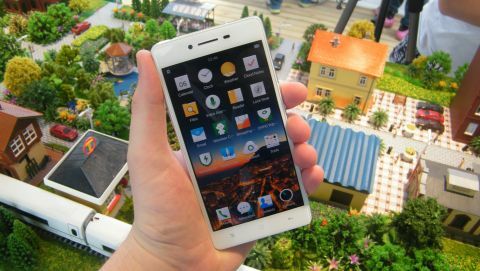 Despite the Oppo R7 featuring a modest 5-inch screen, the inclusion of physical navigation buttons at the bottom results in a rather tall device. A degree of dexterousness may be needed to reach the top corners of the display, although the well-positioned buttons help to minimise in-hand shuffling. For such an affordable offering the full metal unibody construction of the Oppo R7 is incredible, exhibiting absolutely no signs of creaking or flexing. The quality of the fit and finish is right up there with flagships such as the iPhone 6 and HTC One M9, which cost almost twice as much. Machined speaker holes are present at the base of the R7's rear. The smooth metal rear is subtly stylish and pleasantly cool to the touch. At the top-left there's a 13MP rear snapper, which thankfully protrudes far less than the unit found on the R5. Underneath sits the single LED flash, with the noise-cancelling microphone taking up a slightly off-centre position above the Oppo logo. Both the silver and gold variants of Oppo R7 adopt a matte finish around back, which does a good job of resisting fingerprints. In stark contrast to many metal smartphones the rounded-off corners on the back don't dig into the palm, and the chamfered metal frame provides plenty of grip. Arguably the Oppo R7's standout feature is its design. As discussed in the first section of this review, the build quality is superb and it feels lovely in the hand. Oppo also touts the prowess of both the main 13MP camera and 8MP front-facing shooter, which I'll look at more closesly in the camera section of the review. While more and more manufacturers have been adopting Qualcomm's 'Quick Charge' technology, Oppo has been busy perfecting its own alternative: 'VOOC Flash Charge', which was first introduced with the Find 7 and is designed to provide a safe and fast charging experience. At present VOOC charging is only available on Oppo's own handsets. The Oppo R7 is the latest device to support this technology, with the Chinese firm claiming that five minutes on the supplied rapid charger will give you enough juice for a two-hour phone call, and that charging the battery from 0 to 75% can be achieved in just half an hour. In practice I was consistently able to reach over 70% within the allotted time, a quite remarkable feat. Being a Chinese smartphone, it's not surprising that the R7 includes dual-SIM functionality. Only a handful of devices designed in the west, such as the Moto G (2014), support this feature. Yet in Asia and other developing markets this feature has been available for some time, even on the cheapest of handsets. Dual-SIM options are clearly displayed throughout Color OS 2.1. I can see why the feature is so highly sought-after in certain parts of the world. It's extremely convenient if you normally have to carry around separate work and personal phones, while regular international travellers and business people will also appreciate not having to swap SIM cards every few days. 2G, 3G and 4G LTE are usable on both SIM cards, which will certainly appeal to heavy data users, although when you select one SIM to use either 3G or 4G LTE, the other is automatically limited to just 2G. US and international versions of the R7 are available, so users residing in the States and Australia shouldn't have a problem accessing 4G LTE networks. Unfortunately none of the R7 variants support band 20 LTE, so those in the UK who are on O2, giffgaff or Tesco Mobile won't be able to receive any 4G signal. Color OS 2.1, Oppo's customised version of Android, is preinstalled on the R7. For some reason the Chinese firm decided to release the newer Android Lollipop-based software exclusively for the larger R7 Plus, leaving the R7 stuck on 4.4.4 KitKat. However, on the face of it there seems to be very little difference between the two software versions, and I'm hopeful that the R7 will receive the Android 5.1 update in the near future. With little bloatware to bog you down, maneuvering through Color OS 2.1 is a simple affair. The latest Color OS 2.1 upgrade brings improved aesthetics and a host of new features. In general the icons and menus exhibit a flatter, more refined look than before. Stock widgets, such as the clock, now appear slightly transparent, and the music space to the left of the central homescreen has also received a facelift. Likewise, all of the R7's key apps are very similar to what was present on the R5, but have been slightly tweaked to be more visually coherent. As is the case with the majority of Chinese custom UIs, Color OS 2.1 still doesn't feature an app drawer. For first-time smartphone users and those switching from an iPhone, this omission arguably makes navigating around the OS a little simpler. Android veterans on the other hand will probably dislike the multitude of app icons and folders taking up precious widget space on the R7's homescreens. One folder that will be a welcome sight is the one containing key Google apps like Gmail, Chrome and Maps. Other than the variants sold domestically in China, all R7s are shipped with the Play Store and Google Services preinstalled. From previous experience of owning imported Chinese smartphones, I know how much of a chore it can be to get these installed and running smoothly. So being able to use them straight out of the box is a real blessing. As Oppo's global presence grows, higher quality themes will become available in the international Theme Store. Despite many lacking Google apps, devices from China do tend to offer a multitude of customisation options. A Theme Store app is present on the international Oppo R7, but it's a watered-down version of the one found on the Chinese variant. There are fewer themes available, and the ones that are included aren't as polished. That being said, the themes are far from the worst I've seen, and the app still enables you to change the look of the icons, folders, lockscreen and wallpaper. Hopefully the 'Mash Up' feature from the Chinese Theme Store will soon be rolled out globally, as currently you can't combine elements from different themes. In spite of the lack of aesthetic customisation options, Oppo hasn't tried to compensate by adding tons of gimmicky software features. In fact, in the gesture and motion department the Chinese firm have removed the finicky air gestures, opting to focus its attention on 'Screen off' and 'Screen on' gestures. A number of customisable letter-based gestures are available when the R7's in sleep mode. These enable you to either jump straight into an app of your choice, or control your music while the screen is off. The much-loved double-tap to wake feature is also here and, instead of having to reach for the power key, a quick double-tap of the home key will sleep the R7's display. Luckily for those who find accessing some areas of the R7's screen a bit of a challenge, a handy 'Mini-screen' mode can be activated via a simple gesture. Swiping into the centre of the display from either of the bottom corners shrinks whatever's on the screen, and pulls it closer to your preferred hand.